You’ve seen them. Maybe in TV commercials. Maybe as you drive by a city park. At first glance, it looks like a small group of people, swatting flies in super-slow motion. Slow and easy movements, feet spread shoulder-width beneath them, their hands move in graceful, sweeping arcs. Their knees are bent slightly and their backs are straight and erect. Each day, millions of people around the world take part in an ancient tradition. They are practicing what is known as tai chi chuan, pronounced “tie chee chew-on.” Though the origin of tai chi is in the ancient past, what is certain is that it has found its way to the modern world. As the season winds into the chilly days of autumn, our activities turn to the indoors. Nature tells us to slow down but that doesn’t mean we should be less energetic. Being energetic does not equate to being frenetic. And going slow does not necessarily mean being lethargic. With the graceful, classical practice of tai chi chuan, we can learn to increase the flow of vital energy without the need of frantic physical activity most Westerners associate with exercise. Chi Whiz All traditional cultures recognize the life force that is in all living things. In European culture it was named élan vital; in Japanese it is ki; the Kung tribe of the Kalahari call it num; India named it prana and in ancient China it was named chi. Unrestricted flow of chi through the body is essential to a healthy mind and body. Tai chi is an effective and simple way to make that happen. Most sources believe that tai chi developed from an early form of Chinese boxing practiced in Shao-lin temples originated by an Indian Buddhist named Dharuma. Shao-lin boxing was a form of martial art. Practiced to develop strength and courage, it was as much meditation and philosophy as it was exercise. Tai chi uses body movements modeled after nature and often named after the animals or natural events they imitate. Example tai chi movements are named “White Crane Spreads Wings,” “Snake Creeps Down,” “Repulse Monkey” and “Return to Mountain.” Tai chi observes breathing as part of the exercises and stresses mental awareness. A unique characteristic is that tai chi involves great emphasis on flowing movement. Poses are not held but flow into the next set with ease and grace. One of the greatest proponents of tai chi in America was the late Cheng Man-Ch’ing. Growing up in China, Cheng was tormented by a chronic lung ailment. A Chinese doctor prescribed tai chi. Cheng became well and continued his practice of the ancient art. Cheng escaped to Taiwan and became a physician. Eventually he emigrated to New York and became the foremost teacher of tai chi in America. Cheng simplified the 128 movements of traditional tai chi. He taught a composite form that ended up being 37 basics while still incorporating the 128 primary elements. Though he passed on in 1975, his school of tai chi has never been more popular. West Notes East In one landmark study at UCLA, medical researchers found that regular practice of tai chi was at least as effective as vaccine in preventing the affliction known as shingles. The evidence is clear. They just don’t know how tai chi does it. (I do.) The same goes with other medical research done over the years demonstrating that tai chi is a healing art. Shingles is a painful skin condition caused by a virus related to childhood chickenpox. It affects up to 1 million Americans, usually those over age 50. Typical American medical treatment is a vaccine. The research, published in the Journal of the American Geriatrics Society, found that with one group, tai chi performed at least as well as the vaccine. Slow Down to Go Fast Tai chi is at the core of all martial arts and can be practiced by anyone at any level of physical ability. It can improve health, athletic performance and overall wellbeing. Though truly a martial art, it would never be mistaken for one of the “fast” forms like karate, kung fu or tae kwondo. Instead, the goal of tai chi is to perform slow, deliberate movement with relaxed skeletal muscles. 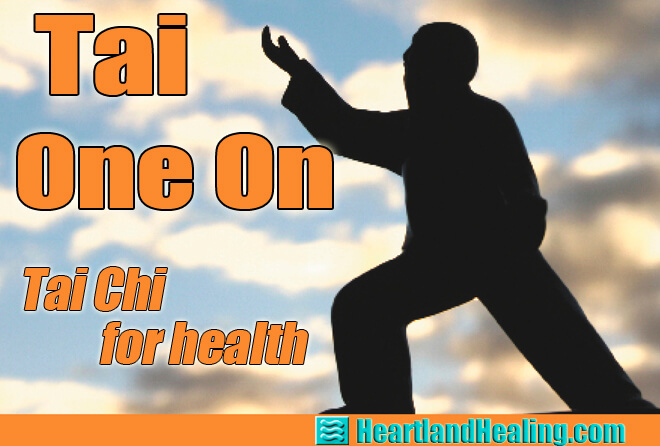 According to Bruce Ballai, founder of the Omaha Tai Chi Association, tai chi emphasizes and demonstrates an important premise: a relaxed body is a better body. Take Us to Our LeaderWhere My Movie Muslims At?